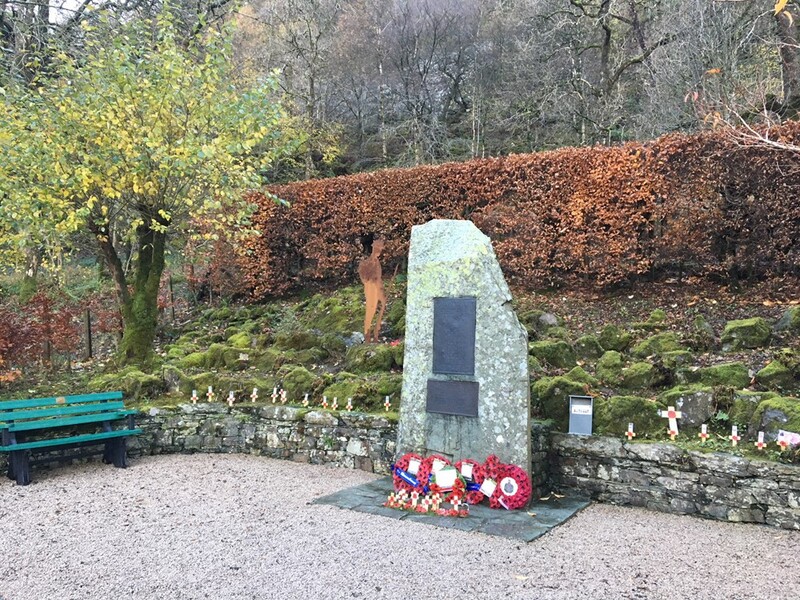 Help us put a “Face to the Name” - we would like to find photos of the four brave men whose names are inscribed on our memorial but for whom we have no photographs. 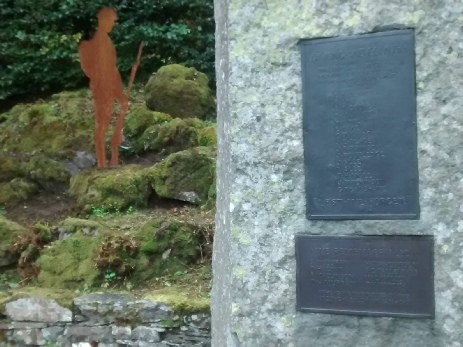 There are 23 names listed on the Patterdale War Memorial, 15 from World War One and 8 from World War Two. We have photos of 19 of them. If you have any photos of the missing individuals please contact us. Driver John Slee Royal Field Artillery. Born 1895. Died of his wounds, June 1917 in Newscastle aged 22. Grew up at Blowick in Patterdale, and then moved to work in County Durham. Brother of Sergeant Robert Slee. 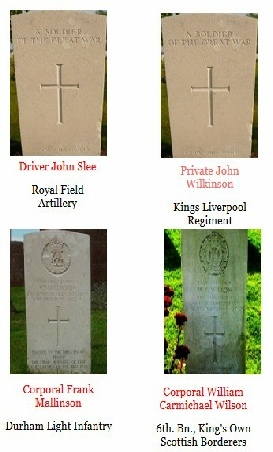 Private John Wilkinson Kings Liverpool Regiment. Born 1899. Died of his wounds, September 1918 in Arras, France aged 19. Born at Glencoin Farm and grew up in Dockray as the adopted son of the Chapplow family. Corporal Frank Mallinson Durham Light Infantry. Born 1904 in Hetton-le-Hole, County Durham. Died July 1945 aged 41 in Carlisle. Lived at Glenridding House and worked at the Ullswater Hotel before the war with his wife Edith Annie and sons Joseph and Thomas. UPDATE OCTOBER 2018- We have now been in touch with Frank’s grandson and have his picture. Corporal William Carmichael Wilson Kings Own Scottish Borderers. Born 1919, Warnlockhead Dumfries. Killed in Action, September 1944 in Holland aged 25. Lived at Brow Field Glenridding and probably worked at Greenside Mine. Husband of Eileen Elsie Wilson, who he married in Patterdale Church just 3 months before he died. If you have any information or photos of these brave men please contact us using the button below and help up put a #facetothename. We also have a number of other “open mysteries” which we would love your help on. 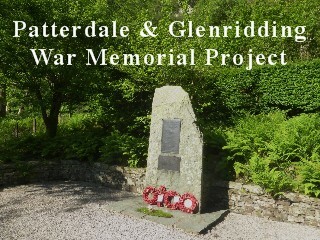 We have made a “Patterdale Parish Book of Remembrance” which has been placed by the war memorial with details of the lives of each of the men listed. 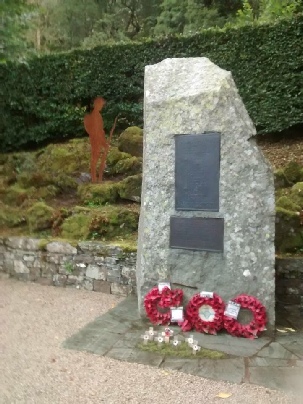 It is housed in a specially built slate cover and ensures that the stories of these remarkable men are known to the many visitors to the War Memorial. 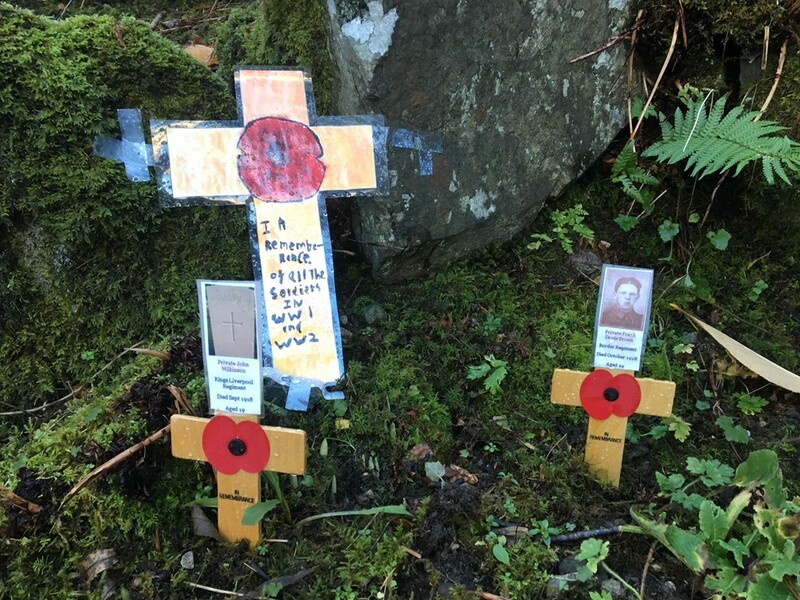 We also placed memorial crosses with photos of each soldier by the memorial in November 2018. 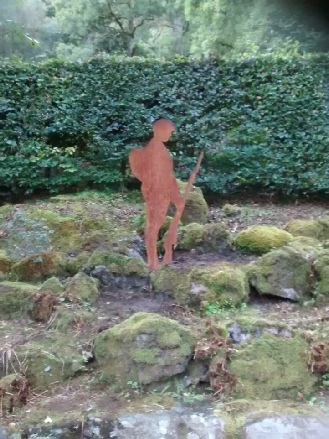 We have installed a new artwork, “John”, on the site of the War Memorial. 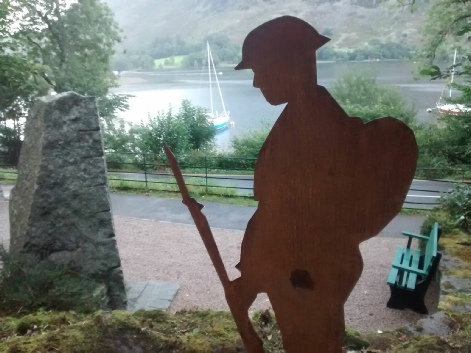 This has been specially commissioned by Patterdale Parish Council and was put in place in time for the 100th anniversary of the end of the war in November 2018. 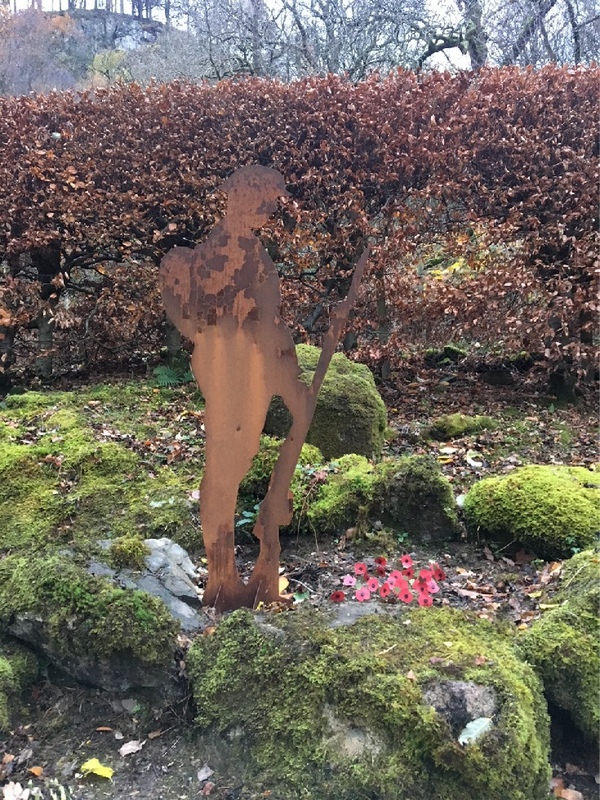 We are very grateful to Ally and Zak, two local metalworkers from local firm Metal Star for their fabulous work on this sculpture. 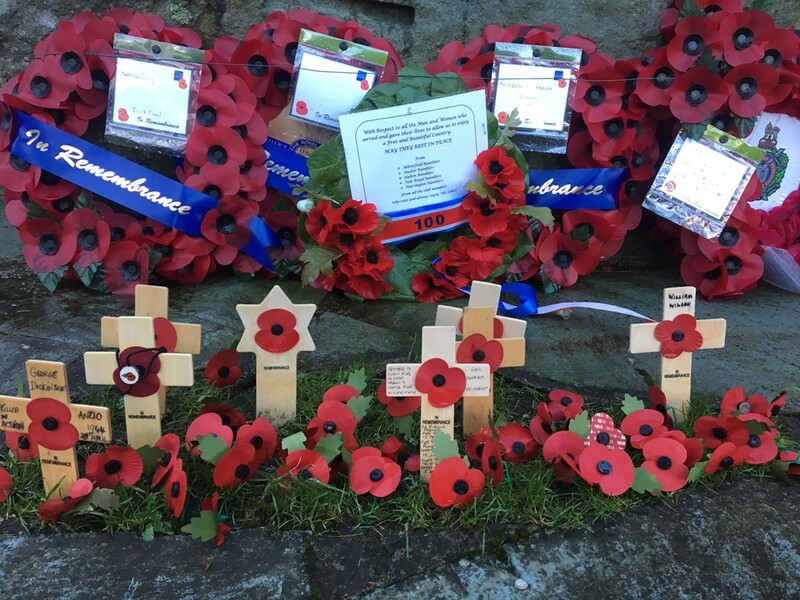 It has been named “John” in memory of John Slee and John Wilkinson who as above are listed on the memorial but for whom, as yet, we have no photos. 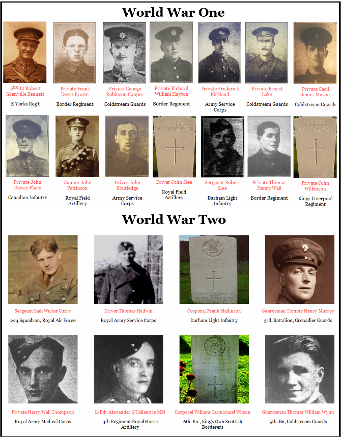 We have also had visits from family members from the Roll of Honour this year, including the Kilners and Waltons. We have received some great photos and updates. If you’d like more information on any of these initiatives please contact us using the link below.